A US marketing agency says it secured brand sponsorship deals for two fictitious social media influencers, after acquiring a following for their Instagram accounts for less than $300 (£231). Writing on its website, Mediakix says its aim was "to prove whether or not it's possible for accounts with fake followers and engagement to secure brand sponsorship deals". 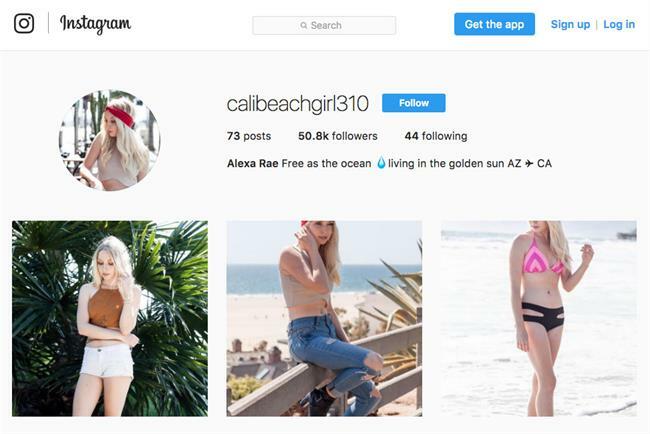 The agency says it created two Instragram influencer accounts based on non-existent people, with bought followers and engagement (likes and comments). The first account featured images from a one-day photo shoot with a model. 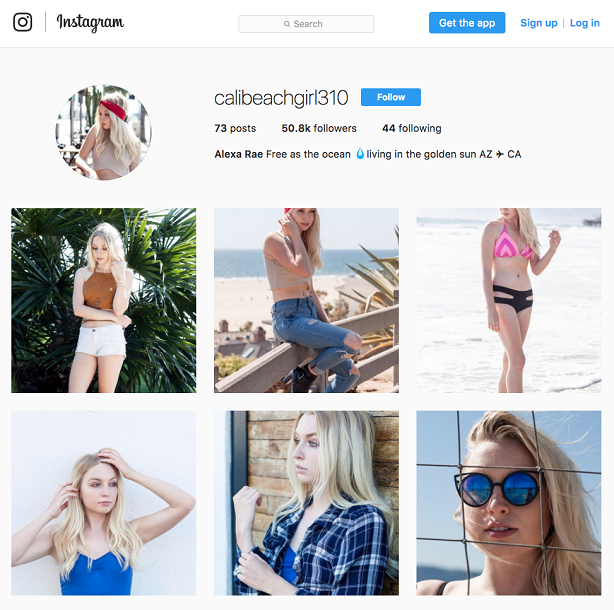 She was depicted as a lifestyle and fashion-centric Instagramer with the username calibeachgirl310. 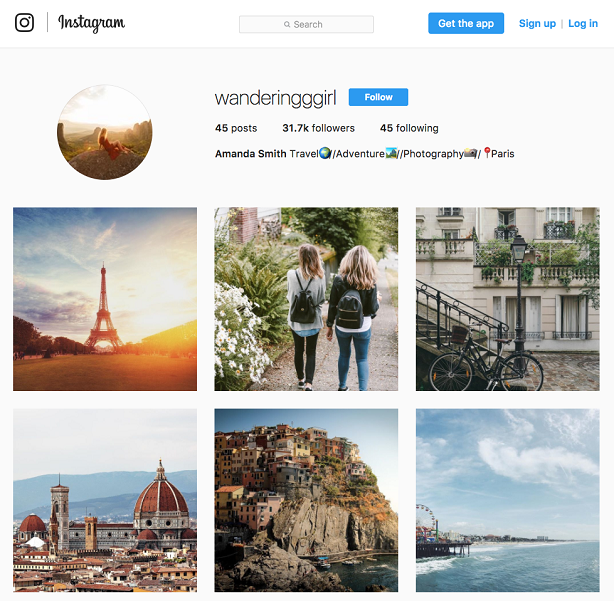 The second account was compiled almost entirely from free stock photos, with the persona of a travel and photography influencer called wanderingggirl, who shared mainly landscape photographs from scenic destinations. Mediakix then bought fake followers for the accounts; initially at a rate of 1,000 per day, to avoid being flagged as suspicious by Instagram. However, they said they were later able to buy up to 15,000 at one time with no problems encountered. Prices ranged from $3-$8 per 1,000 followers. Within two months, the travel account gathered 30,000 followers, and the fashion account 50,000. The agency then started buying likes and comments, paying around 12 cents per comment, and $4-$9 per 1,000 likes. For each photo, Mediakix bought 500 to 2,500 likes and 10 to 50 comments, and engagement was scaled up as the follower count grew. Once 10,000 followers were reached, Mediakix said it was able to sign up the accounts for new brand campaigns. The fashion account secured one deal with a swimsuit company and one with a national food and beverage firm, and the travel account secured brand deals with an alcohol brand and the same national food and beverage company. For each campaign, the 'influencers' were offered monetary compensation, free product, or both," the agency stated. The paid deals were worth around $130 in total for wanderingggirl and $400 for calibeachgirl310, it said. It continued: "Brands and advertisers eager to reach audiences on popular social media channels and seeking quick entry into the influencer marketing space, are turning to platforms, automation and micro-influencers in hopes of making the media buying process more turn-key and easier. "However, akin to the ad fraud that's afflicted display ads, Instagrammers with completely or partially fake followings and/or engagement present advertisers with a unique form of ad fraud that's becoming more and more commonplace and could be siphoning tens of millions of dollars from brands." An Instagram spokesman said: "We take spam and inauthentic behaviour very seriously and have a number of teams dedicated to detecting fraudulent behaviour and shutting it down. We consider services that automate likes or follows to be spam, and we will continue to aggressively remove them from the platform according to our Community Guidelines." The experiment has caused much discussion on social media, with many suggesting that brands need to be more aware of the issue.